I’m always hesitant to say a recipe is the “best ever,” especially for a dessert like Rice Krispies Treats that everyone knows and loves. But once you’ve tinkered around with a recipe for weeks — asking your kids, their friends, and basically anyone who passes through your house (tutors…cable guy…electrician…) to sample different versions — you can say it’s the “best” with some confidence. Line a 9 x 13-inch pan with heavy duty aluminum foil and lightly grease with softened butter. Set aside 2 cups of the marshmallows. In a large pot, melt the butter over medium-high heat (save the wrappers for pressing the mixture into the pan). After the butter melts, it will begin to bubble, foam, and turn golden around the edges. Eventually it will turn a dark golden color and smell nutty -- watch carefully, it will go from golden brown to burned quickly. (You'll see little bits of brown sediment forming; that's okay.) Once the butter is browned, remove the pan from the heat and add the remaining marshmallows, vanilla, and salt. Place the pot over low heat and stir the mixture with a wooden spoon until the marshmallows are completely melted. Remove the pan from the heat and add the cereal. Using a rubber spatula or wooden spoon, stir until evenly combined. Add the reserved marshmallows and stir until they are softened and partially melted (you want pockets of goo). Transfer the mixture to the prepared pan and, using the butter wrapper or damp fingers, press the mixture gently into an even layer in the prepared baking pan. Let cool at room temperature for at least an hour. Use the foil overhang to lift the treats onto a cutting board, then cut into 18 to 24 bars, depending on how large you'd like them. Store in an airtight container at room temperature for up to 2 days. 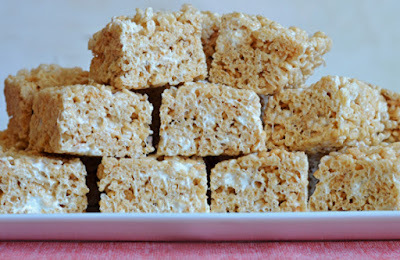 0 Response to "Best Ever Rice Krispies Treats"